I Rode Knott’s HangTime Dive Coaster! I was invited to a special media event in order to share about my experience with you. All opinions are my own. HangTime is now open and if you haven’t made your way over to check it out yet, I don’t think you should wait any longer. There’s really never been a better time to grab one of Knott’s Season Passes. I mean, it’s affordable, they offer payment plans and there are no blackout dates. A Regular Season Pass includes unlimited admission in 2018 to Knott’s Berry Farm with no blackout dates. A Gold Season Pass includes unlimited admission in 2018 to both Knott’s Berry Farm and the newly expanded Knott’s Soak City Waterpark with no blackout dates.For more info about Knott’s Season Passes, go here. Connect with Knott’s on Facebook, Twitter, and Instagram. Join in the conversation on social using #KnottsHangTime to share about your experience riding it! I was invited to attend a media day at Knott’s . No other compensation was received. All opinions are 100% my own. 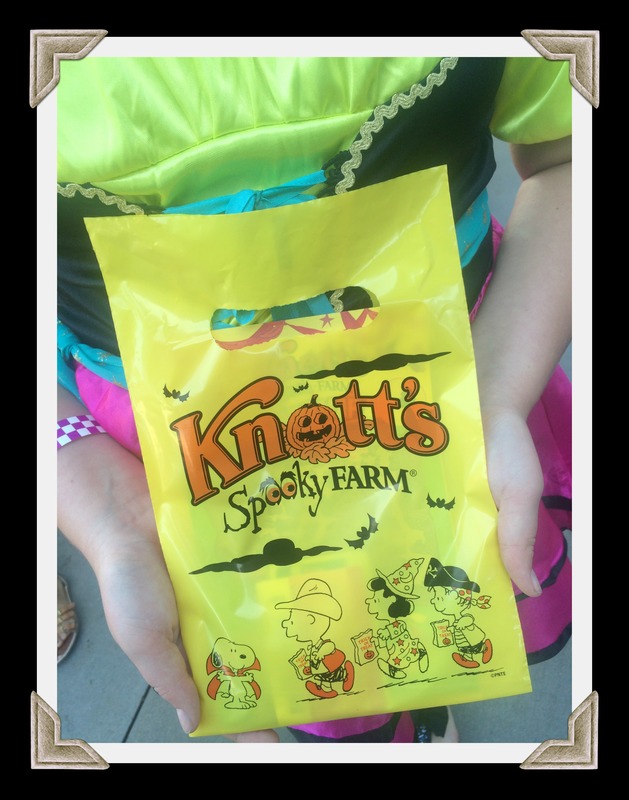 Have you had a chance to check out Knott’s Spooky Farm yet? 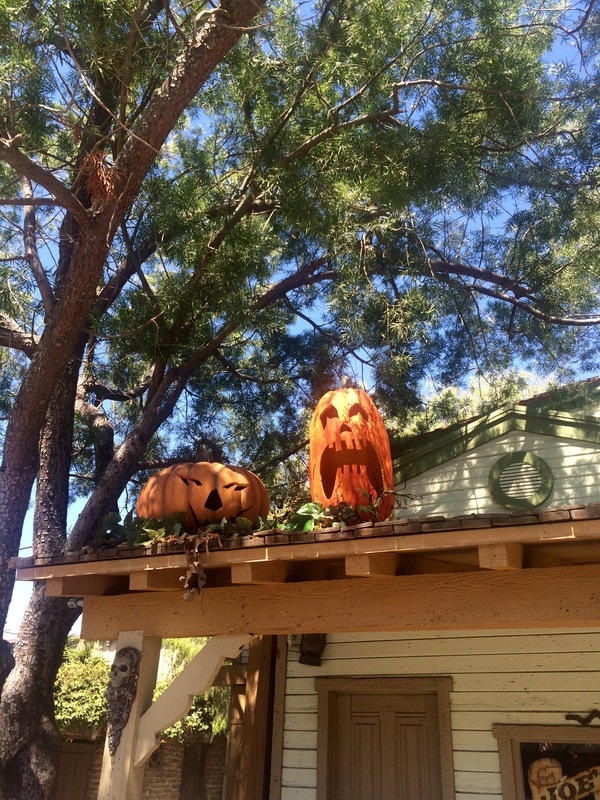 This year you can enjoy not-so-spooky daytime Halloween fun, throughout the park, every weekend in October! There are so many things to see and do and it’s all focused on Halloween cheer rather than fear! Activities are geared towards children ages 3-11 but I’m *29 and had the best time there last weekend! 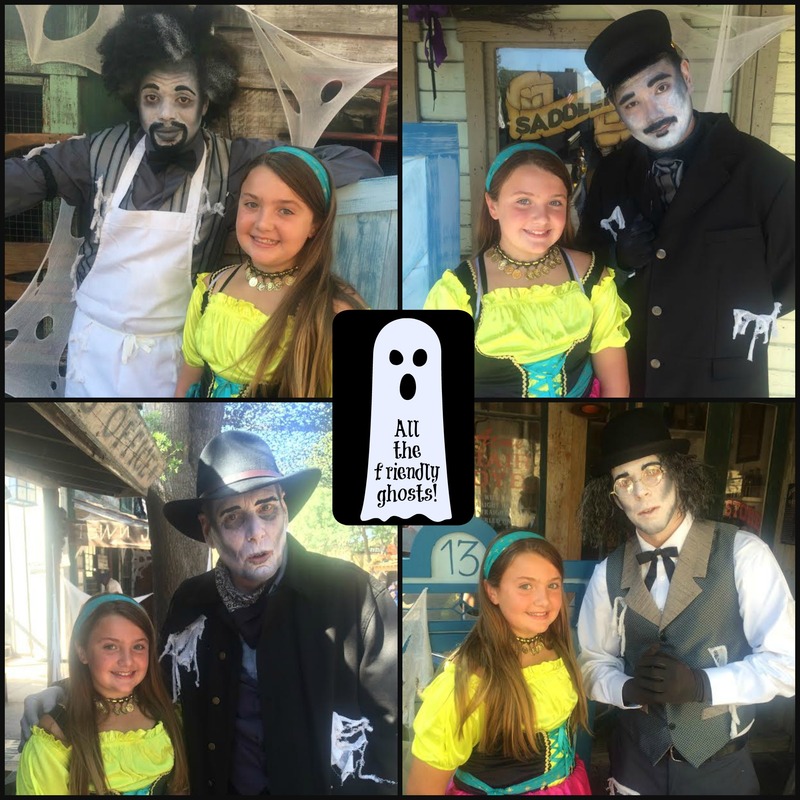 Ghost Town Trick or Treating – Kids will have so much fun trick or treating in Calico Ghost Town. They’ll encounter a different friendly ghost at each station and receive a special treat from them! Be sure to bring a trick or treat bag or bucket! 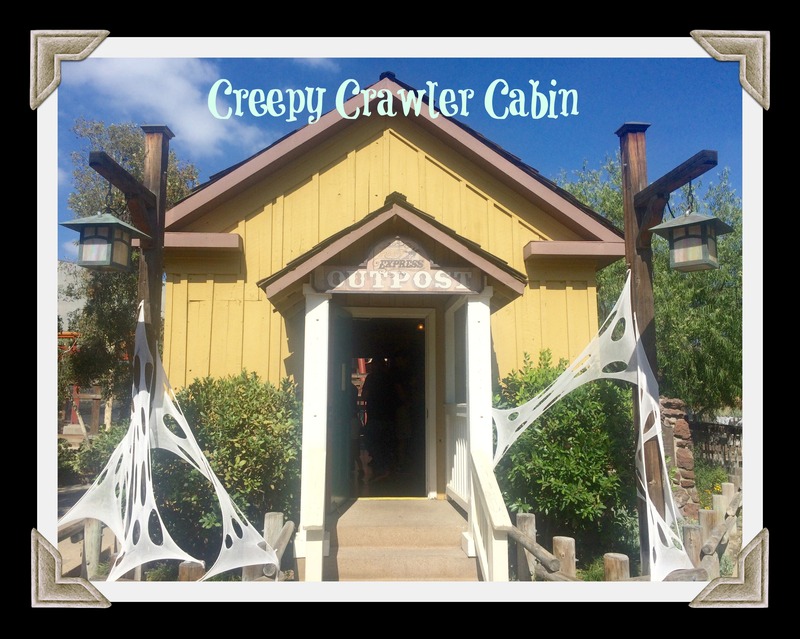 Creepy Crawler Cabin – Explore creepy crawlers and other things that’ll make your skin crawl in the Creepy Crawler Cabin, located inside the Pony Express Outpost in Ghost Town. 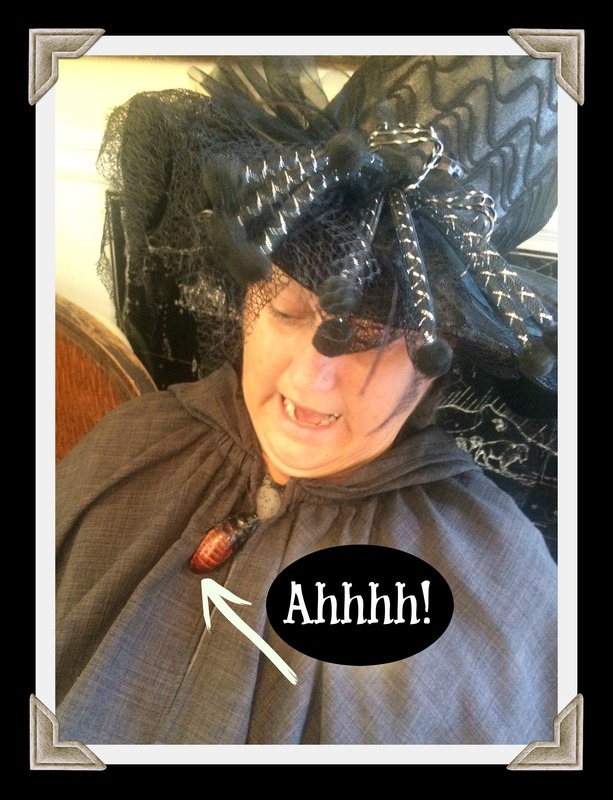 There are even opportunities to touch some of them if you’re extra nice to the resident there…a witch! 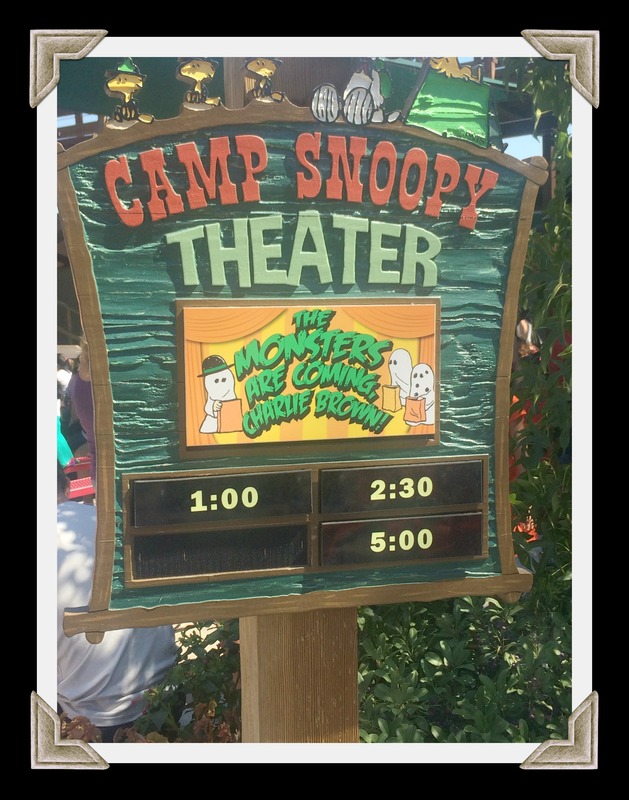 “The Monster Are Coming, Charlie Brown!” Show – Over in the Camp Spooky Theater, located inside Camp Snoopy, you can catch one of the daily shows of this musical production, starring some of your favorite Peanuts characters. 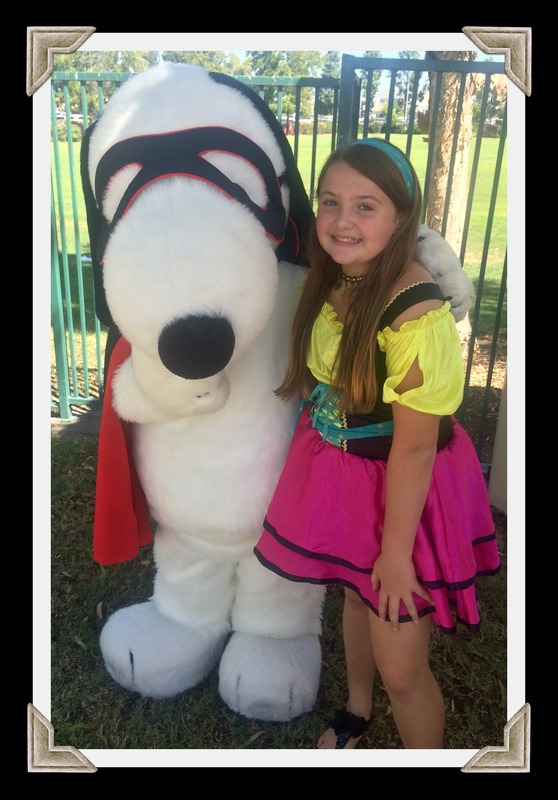 Snoopy’s Costume Contest and Dance Party – Sign up to enter the costume contest held in the Camp Spooky Theater. Guests (under age 12) in costumes who enter have the chance to win fun prizes. Note: Adults are not permitted to wear costumes in the park. Spooky Hollow Maze – Travel through a spooky forest with gigantic jack-o-lanterns and you might even encounter the Headless Horseman. For a nominal fee, you can decorate your own pumpkin after you exit the maze. 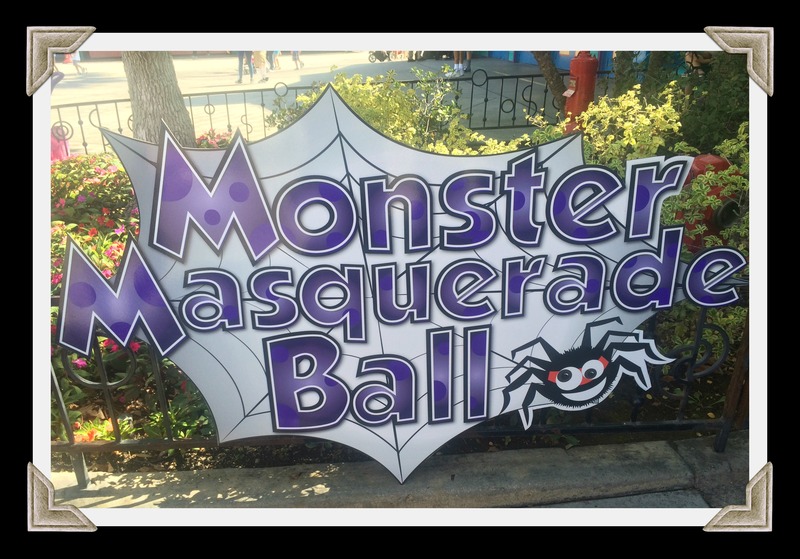 Monster Masquerade Ball – Join in on some karaoke fun at the Monster Masquerade Ball! 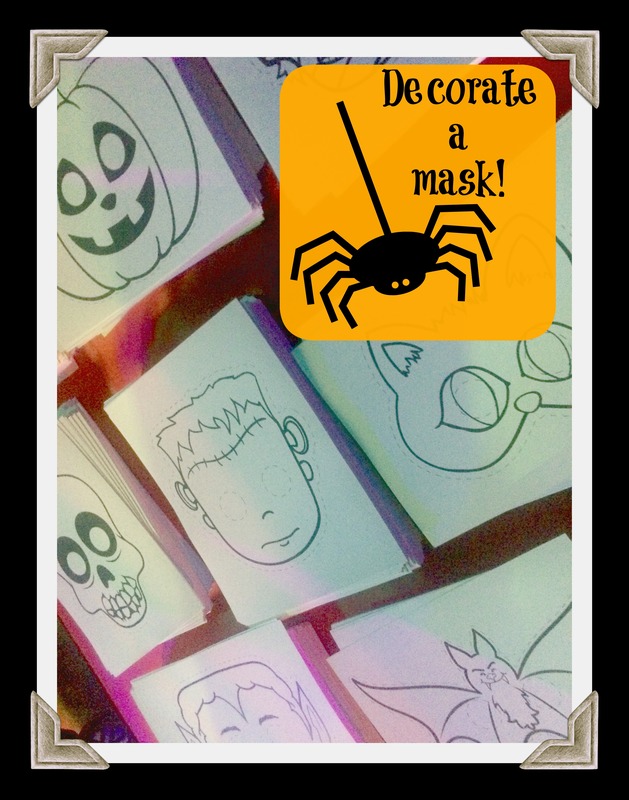 Kids can sing along with their favorite songs and also choose a Halloween mask to color and decorate and take home. See? 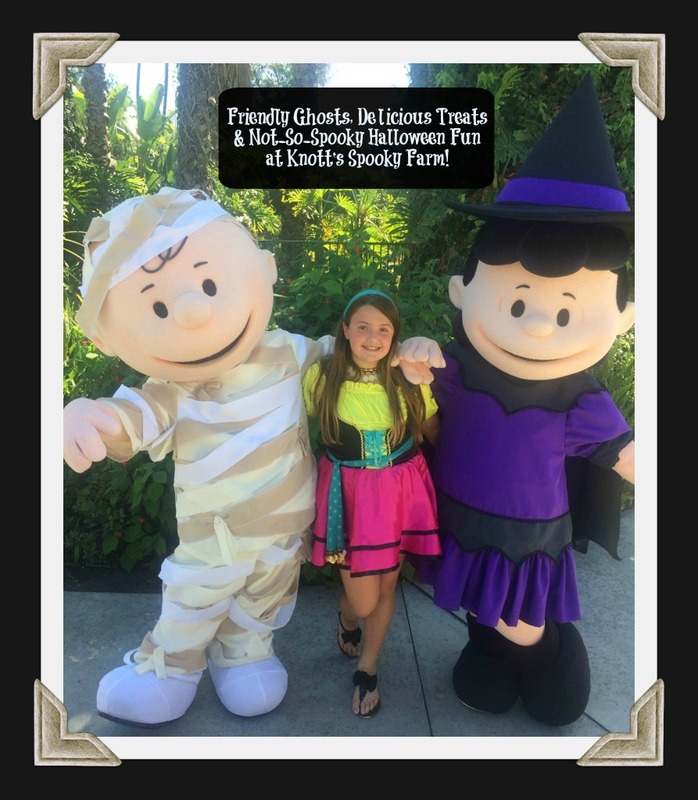 I told you there’s a ton of stuff to see and do at Knott’s Spooky Farm! I love that they’ve made this family friendly Halloween celebration a park-wide event this year because we also spent time going on all of our favorite attractions, too! All of the Knott’s Spooky Farm fun is already included in the price of your regular park ticket! 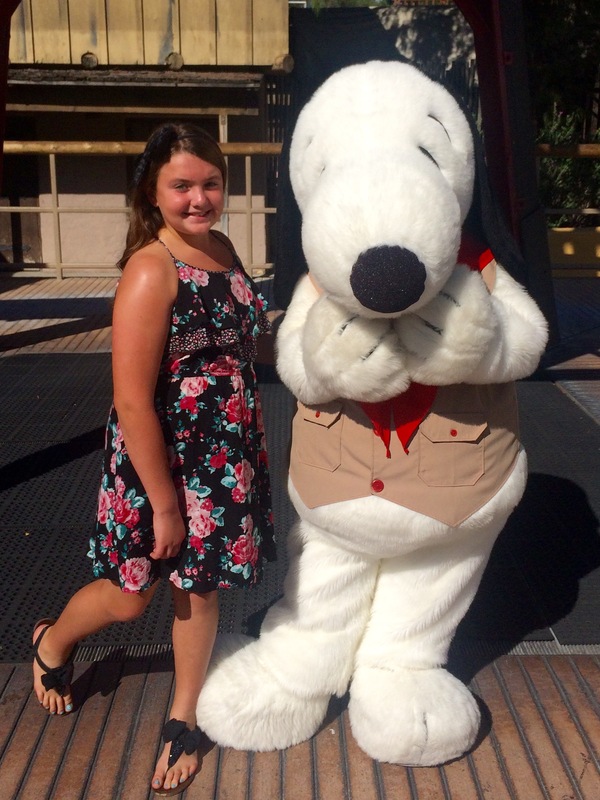 Why not consider getting a Knott’s 2016 Season Pass? 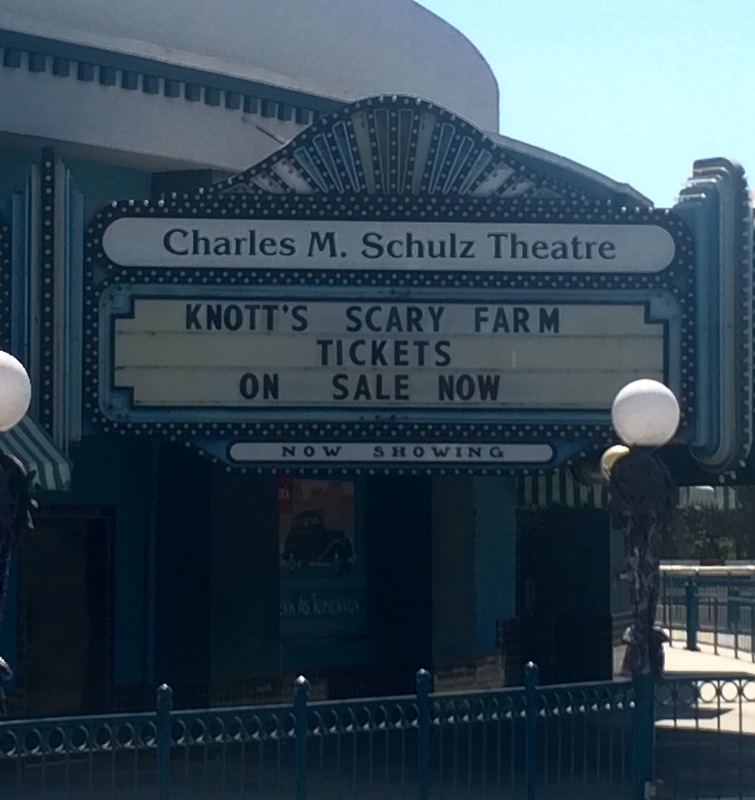 Right now it includes one 2015 visit, which you could use for a day at Knott’s Spooky Farm! For more information about Season Passes, click here. 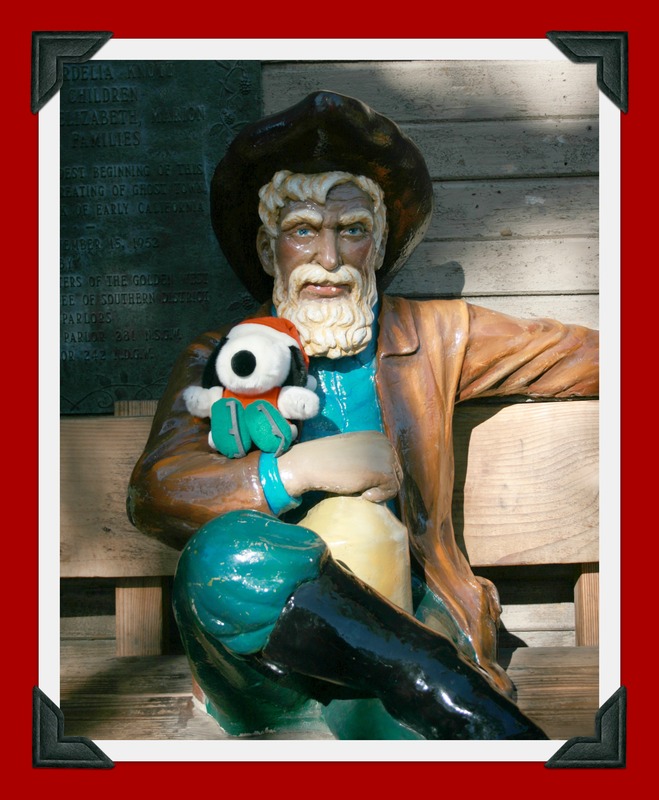 You can also purchase your Knott’s tickets online at a discount. To purchase yours, click here. 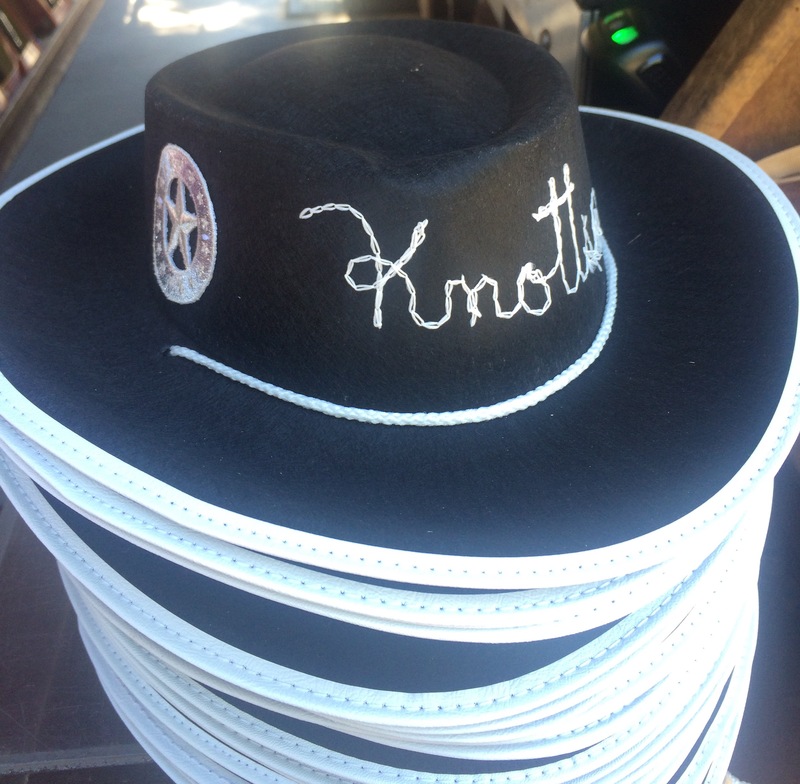 A very special thank you to Knott’s for hosting us for a very fun day in the park. 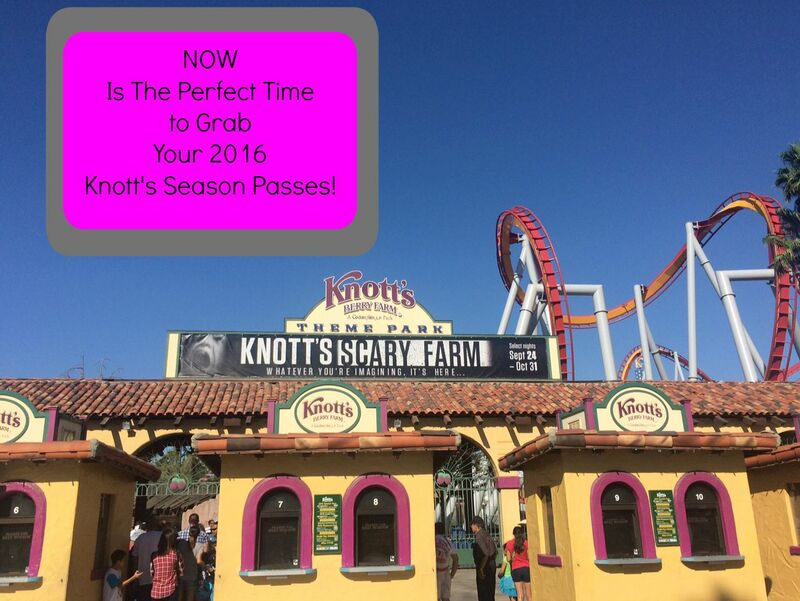 NOW Is The Perfect Time to Grab Your 2016 Knott’s Season Pass! I’m LOVING the arrival of Fall, even though it’s still boiling hot in SoCal! However, the “official” arrival of Fall means that all of the big holidays are just around the corner! Can you tell the holidays are my favorite time of year? 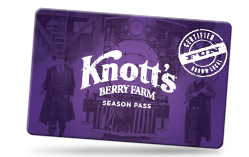 For anyone who’s a lover of Knott’s Berry Farm (like me), the end of the year is the BEST time to grab Knott’s Season Passes for the upcoming year. Yep, you can buy Knott’s 2016 Season Passes right now at their lowest prices of the year! You can pay them off with Season Pass Easy Pay Payments. Yes! Knott’s will let you make payments. That makes it even more affordable. Buy your 2016 Season Pass now and enjoy unlimited visits in 2016 with no blackout dates plus discounts on food and merchandise! Regular Season Passholders also receive a discount on tickets to Knott’s Scary Farm! Knott’s is also offering a 2016 Gold Season Pass. You also have the option to make payments with Season Pass Easy Pay Payments. 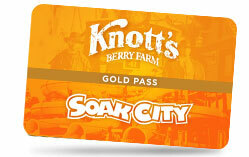 With the Knott’s Gold Season Pass you get 2 parks in 1. If you opt to purchase a 2016 Gold Season Pass you’ll enjoy 2 Parks, including all the thrilling rides at Knott’s Berry Farm and cool slides at Knott’s Soak City Waterpark. It pays for itself in less than 2 visits! Gold Season Passholders also receive a discount on Knott’s Scary Farm tickets. So here’s another option. 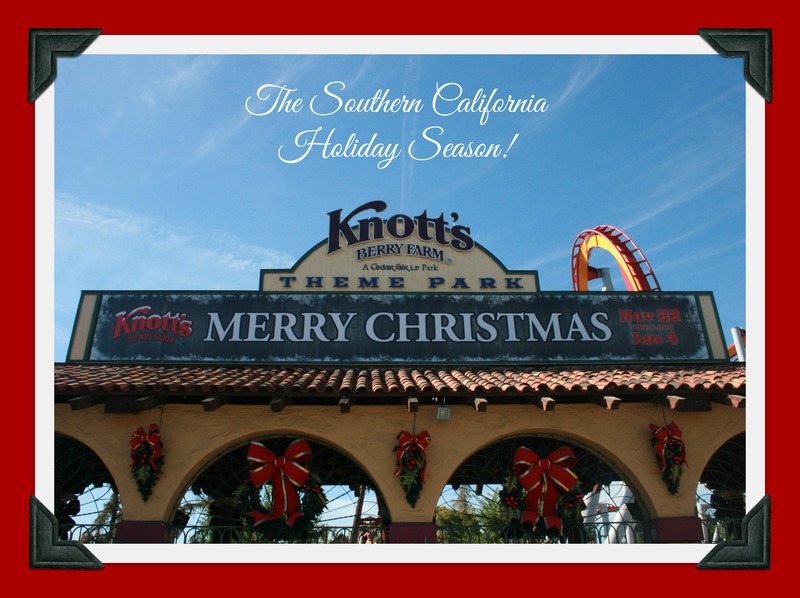 It’s one of my FAVORITE options to add onto Knott’s Season Passes, especially for families! 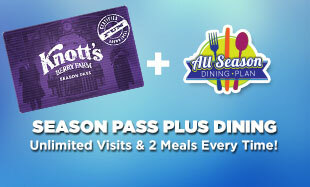 I’m talking about the Knott’s Regular Season Pass WITH the Dining Plan! It can be expensive to spend a day out with your family and have to feed them meals. This is such an affordable option and allows you to save so much money on food for your family, when you’re at Knott’s. You also the option to make payments with Season Pass Easy Pay Payments. 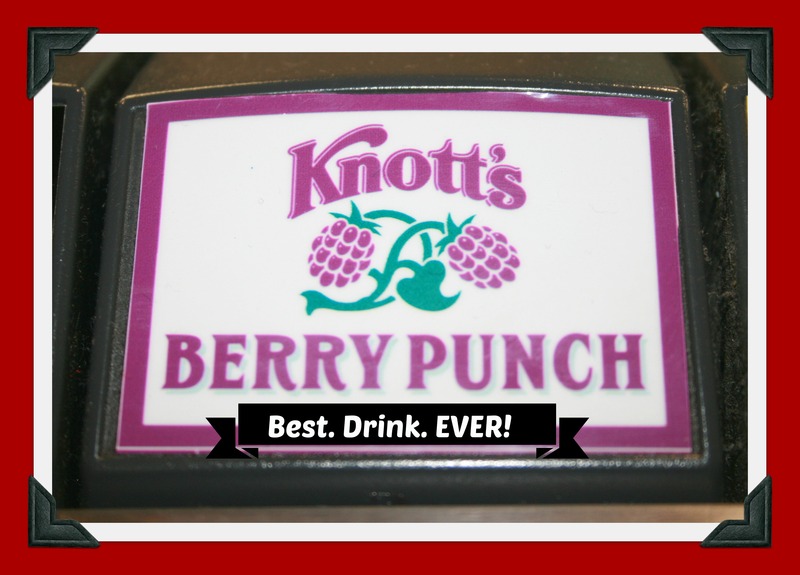 With a Season Pass Plus All-Season Dining, you get all the exclusive benefits of being a Season Passholder, plus one lunch and one dinner at participating locations throughout the park every day you visit Knott’s Berry Farm in 2016. Beverages are not included. 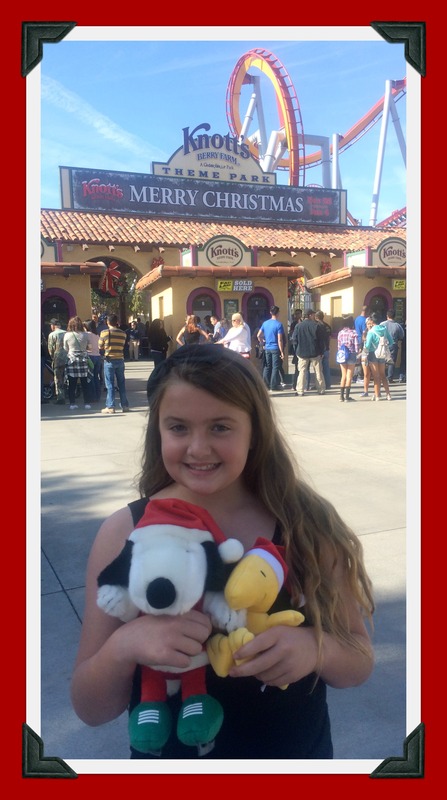 Not only do Knott’s Season Passes make a great gift for friends and family, they are an incredible deal for any family, large or small! They’re affordable and allow you to create new memories together, throughout the year! For more information and pricing for Knott’s Season Passes, click here. Connect with Knott’s on Facebook, Twitter & Instagram. The opinions in this article are 100% my own. I do not work for, or with, any brand mentioned in this article, nor do I have any official relationship with them. I have a relationship with GigaSavvy, for whom I create original editorial content. Summertime is my favorite time of year! (Although it’s hard to really ever complain about the Southern California weather here) I love the relaxed feeling of summer, especially the slower pace of life since I’m off work (I teach school). Summer is when I get to enjoy extra time with my family! 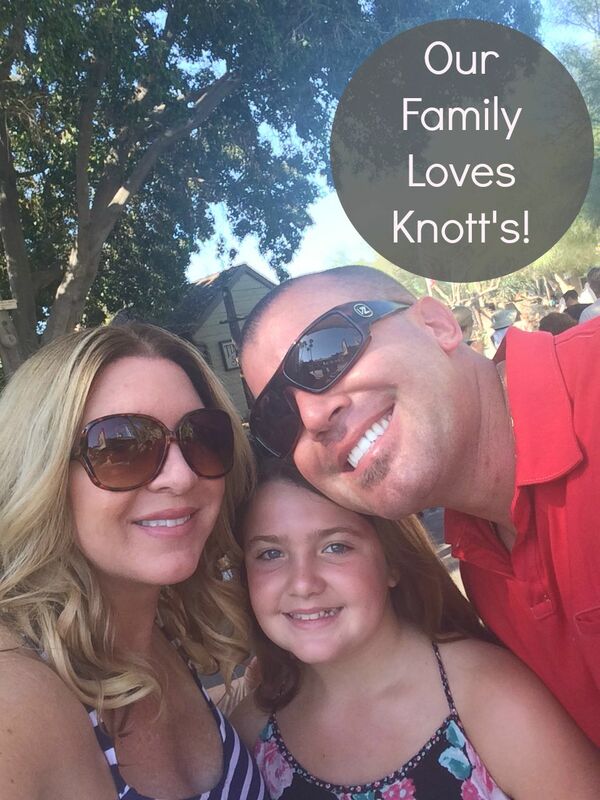 One of our favorite things to do together is go to Knott’s! We can’t get enough of the attractions, the food, and all the entertainment. 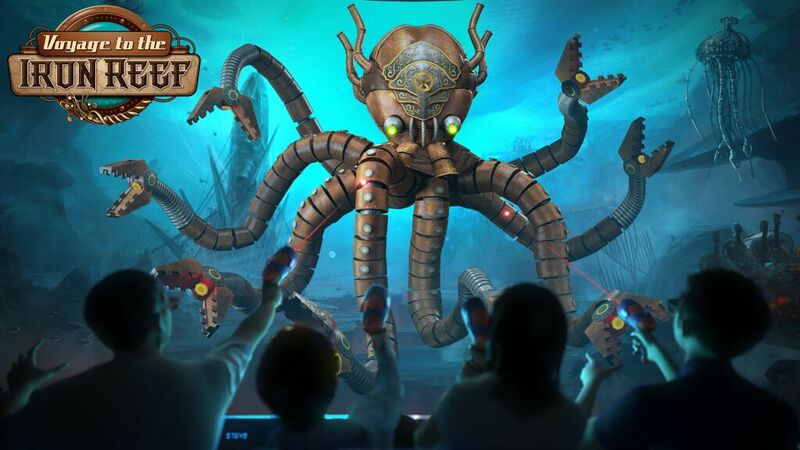 If you haven’t already heard, one of the biggest things to hit Knott’s this summer is the opening of the latest attraction, Voyage to the Iron Reef™! This brand-new attraction opened on May 15, 2015 and is a spectacular, interactive 4-D ride for the entire family. Inside the attraction, you’ll help save Knott’s from mysterious creatures emerging from the seas beneath the Boardwalk in a cutting edge media-based battle. Through enchanting underwater forests, disorienting ocean current tunnels, and mysterious mechanical wreckage, high definition 3-D animation will surround guests at every turn. Not only am I am anxious to get to Knott’s this summer to go on my own Voyage to the Iron Reef™, but there are also 2 new exciting shows to see! I love the shows at Knott’s! The first new show features some of my childhood favorites, The Peanuts Gang. Watch Snoopy and his friends appear in the newest production to hit the Charles M. Schultz Theatre, Blockbuster Beagle!…on ice. You can join Snoopy and his Peanuts buddies “go Hollywood” bringing Walk of Fame glamour, dazzling movie lot escapades and California excitement to a brand new ice show adventure. Join Snoopy and our World-class ice skating stars at the Charles M. Schulz Theatre for this amazing new production! 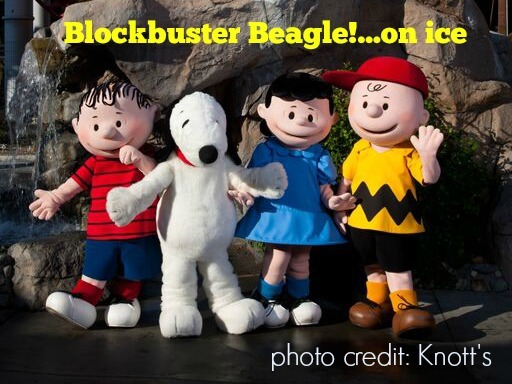 Blockbuster Beagle!…on ice runs June 13 – August 23 and is dark on Wednesdays. 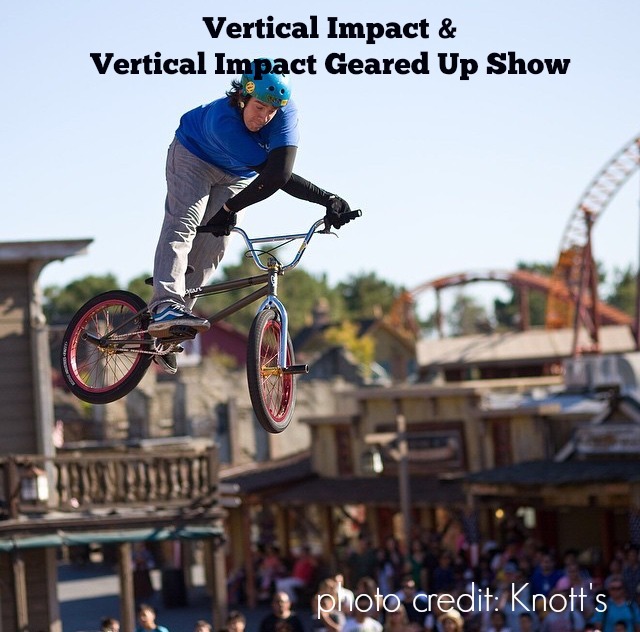 The second new show at Knott’s this summer is the Vertical Impact & Vertical Impact Geared Up Show. This show is guaranteed to have you on the edge of your seat as you witness the ultimate blend of extreme stunts with high flying acrobats performing a one of a kind performance perfect for the entire family! The fun continues after dark with Vertical Impact, Geared Up! This high energy show is set to the most popular songs of today, combining everything from trampoline stunts, bmx bikes, skaters, dancers, and aerialists. Every show ends with an informal meet & greet for the guests with the entire cast on stage. The cast pumps up the volume with the latest hits, the biggest tricks and awesome special effects. The pace is intensified, the stunts are electrified, and the cast is breaking down the walls, defying gravity, and taking it all to the next level. Watch the show for the amazing aerial acrobatics, and crazy trampoline & vertical wall stunts, then stay for the after party and be a part of the show! Our own “DJ Nytemadness” will keep the party going mixing all the best of current EDM, dance & pop hits after each show while the cast joins the guests of all ages to dance, party, take selfies, and just be a part of it all. The show runs June 13 – August 23 and is dark on Mondays & Tuesdays. In addition to these 2 brand-new shows at Knott’s this summer, there’s a TON of other entertainment going on at the park this summer too. This is where I feel like I should stop and talk about Knott’s Season Passes because there is WAY more than one day’s worth of fun to take in at Knott’s. You’re going to want to come back to Knott’s (and Knott’s Soak City Water Park) a bunch of times! Especially during the summertime! 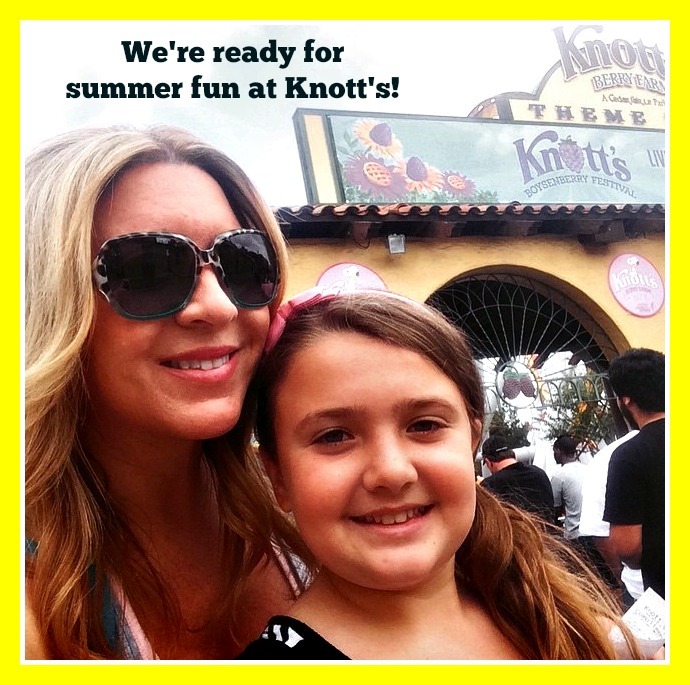 Do you know how awesome a Knott’s Season Pass is? Not only is it the most affordable ticket in town, Knott’s also offers the option of payments to make it even more do-able for your family. The passes pay for themselves within a few visits too. You can also upgrade to a Gold Season Pass! The Gold Season Pass allows you to enjoy all the cool waterslides and fun in the sun at Knott’s Soak City Water Park, in addition to all the thrilling rides at Knott’s Berry Farm! The Gold Season Pass pays for itself in less than 2 visits! 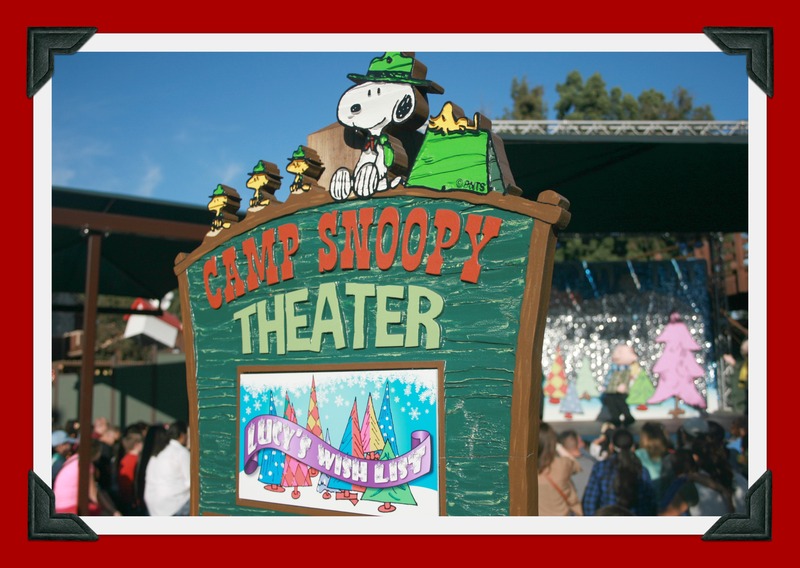 Charlie Brown’s Happy Campers – Camp Snoopy Theatre: Join Charlie Brown, Linus, Lucy and the world’s most popular beagle, Snoopy in a show that’s sure to make an outdoorsman out of anybody! The show runs daily from June 14 through September 1. Big Band Swingin’ Sundays: Jump, Jive & Swing to the sounds of Orange County’s best local Big Bands. Catch them on Sunday evenings from June14 – August 30. Ghost Town Streetmosphere: Ghost Town is alive with townsfolk who will put you smack dab in the middle of the Wild West. New residents have put down stakes recently… Clem Culpepper, the ever hopeful gold miner, Ma & Pa Shine, our resident moonshiners & Nathan Quickly, the Pony Express Agent. And as you mosey on through Ghost Town, say “Howdy” to returning favorites, Dusty Trail, who’s never without her six-shooter, Miss Ruby, the purtiest Saloon Gal in town, Miss Apple the School Teacher, and the rest of the Calico townsfolk. The Ghost Town Streetmosphere runs daily from June 13 – September 7. Salsa Bands – Fiesta Plaza Stage: Nothing says a party at the Fiesta Plaza stage better than the energy created by some of Orange County’s most popular salsa bands. Enjoy the salsa bands on Friday, Saturday & Sunday evenings from June 13 through August 23, Plus August 29, 30 and September 5, 6, & 7. The Ghost Town Miners – Spurs Stage: For a “Yeehaw” of a good time you won’t want to miss the Ghost Town Miners sing and play some of the best bluegrass this side of the Rio Grande! The show runs Tuesday through Thursday from June 16 – August 20. The Marshal Purdy Show – Birdcage Theatre: Come on in for some old fashioned, homespun fun that’s sure to tickle your fancy and bust your gut on Tuesday & Wednesday from June 17 – August 21. The Big Fat Steve Band – Boardwalk Circle Stage: Back by popular demand, The Big Fat Steve Band-The Kings of Kool is a fun, exciting dance band with a swingin’ beat. Enjoy the live musicality of rockabilly, swing and classic sounds. The only thing missing is your dance moves. Come on out Wednesday through Saturday from June 13 – August 29 Plus September 5 & 6. 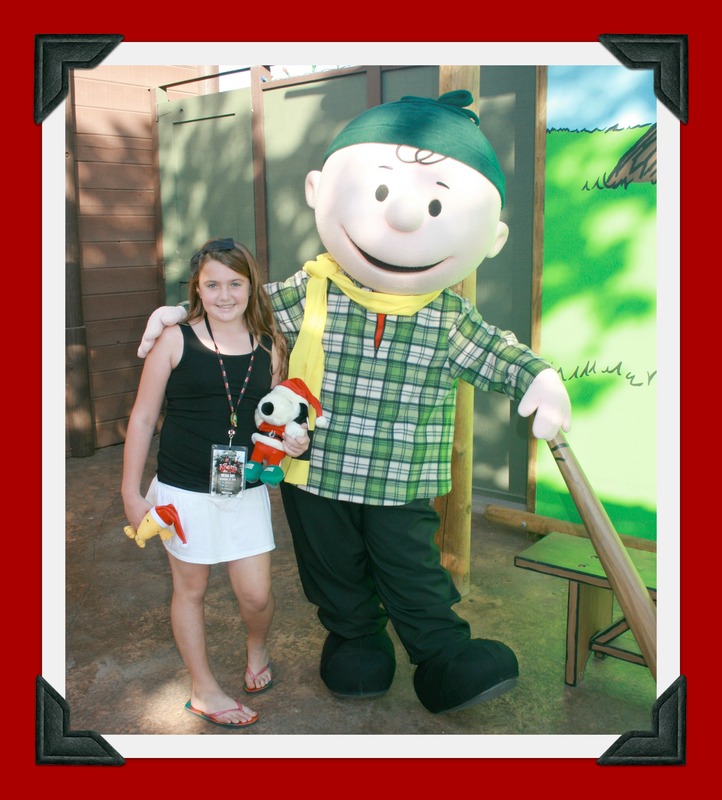 The Peanuts Gang – Camp Snoopy: Meet and hug one of your favorite Peanuts characters! Snoopy, Charlie Brown, Linus, Lucy, Sally, Schroeder, Franklin, Woodstock, or Peppermint Patty. The characters are available in the park year round and vary daily. Calico Saloon Cancan Show – Calico Saloon: What’s a Saloon without a show? Don’t miss the Calico Saloon Show for some good old’ fashioned bar room fun. We heard that the dancin’ girls even perform that new fandangled dance from Paree, France, the Cancan! You might even want to cool off with a tall cool bottle of the hard stuff…Sarsaparilla! Enjoy the Calico Saloon Cancan Show daily from June 13 – September 30, Plus September 5 – 7. Fool’s Gold Stunt Show – Wagon Camp: Will the bad guys manage to re route and steal the gold? Find out in this rowdy, comical, western stunt show presented on Knott’s legendary Wagon Camp stage. Watch the show year round. Indian Trails: You won’t want to miss the beautiful music, authentic costumes and historically rich traditions presented at the Indian Trails Stage. The Indian Trails are presented Thursday through Monday on a year round schedule. Mystery Lodge: Sit back and let this award winning, one of a kind attraction mesmerize you as our Native American Storyteller shares stories of his rich history and culture. The special effects of Mystery Lodge will amaze you daily, and is open year round. So, raise your hand if YOU’RE ready for some summer fun at Knott’s? I know you can’t see me right now, but I”m raising mine! Hope to see you in the park this summer! Connect with Knott’s on Facebook, Twitter, and Instagram! 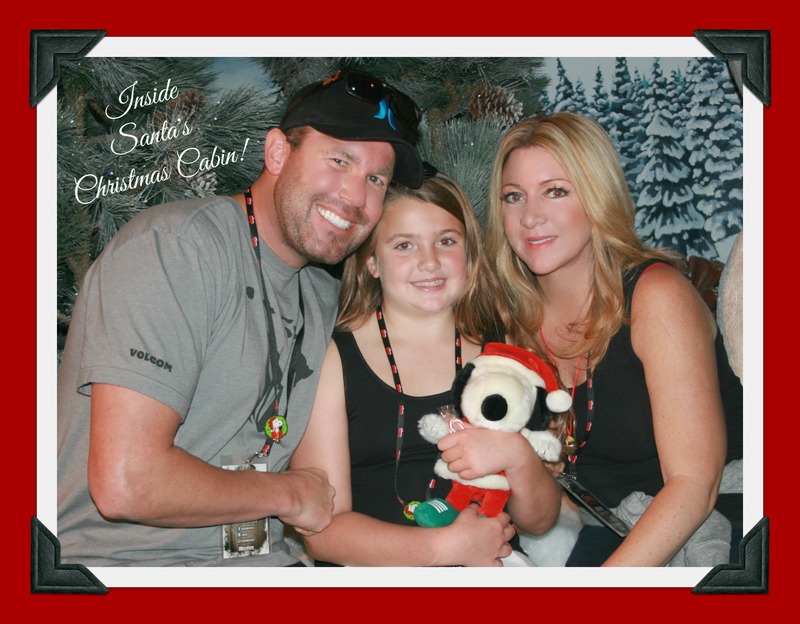 Celebrating the Holiday Season at Knott’s #MerryFarm With Our Little Family! Disclosure: My family & I were invited by GigaSavvy to attend a Media Day at Knott’s Merry Farm in order to write this review of our experience. No other compensation was received. All opinions are 100% my own. 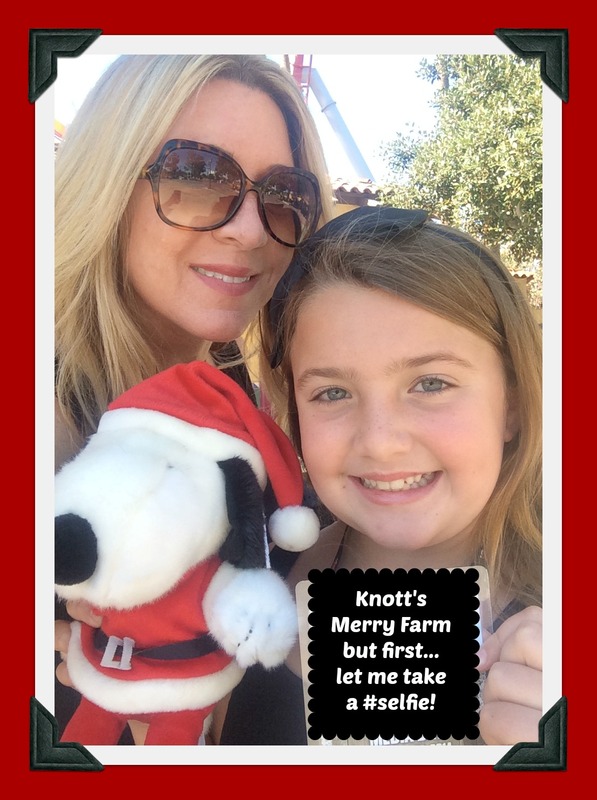 The holiday season has just began and our family had so much fun kicking it off with a visit to Knott’s Merry Farm this year. 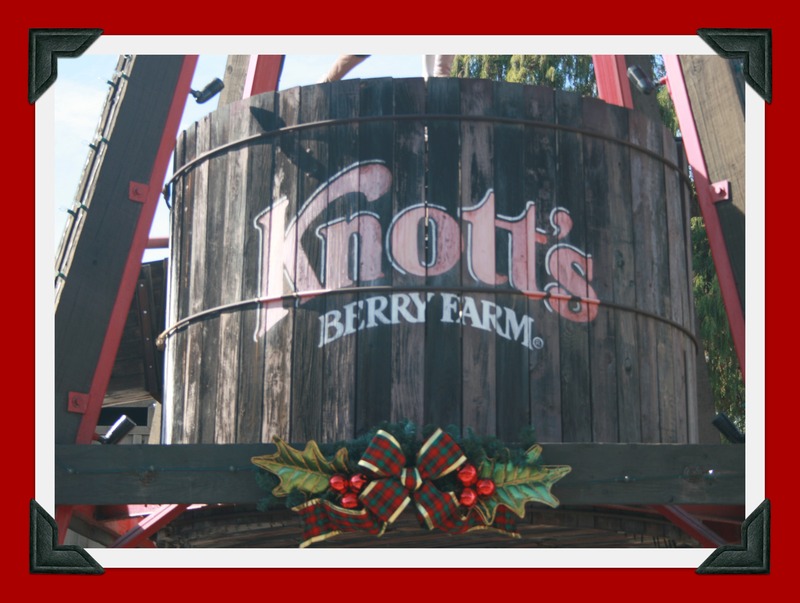 We live locally and love going to Knott’s Berry Farm but this was actually our first time getting a chance to visit during “Merry Farm”, which runs this year from November 22nd to January 4th! 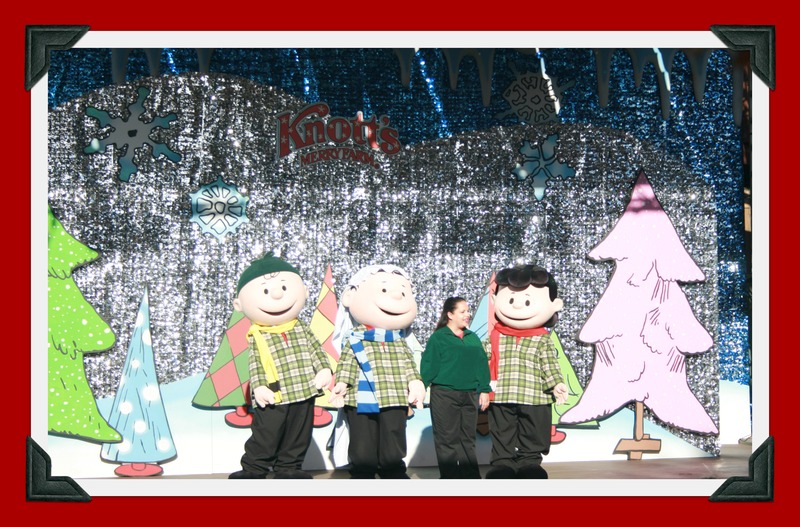 The park is adorned with holiday decorations and the Peanuts characters are dressed in holiday attire! The sunny Southern California weather justified us wearing summer attire that day. Our first stop of the day was at Camp Snoopy! 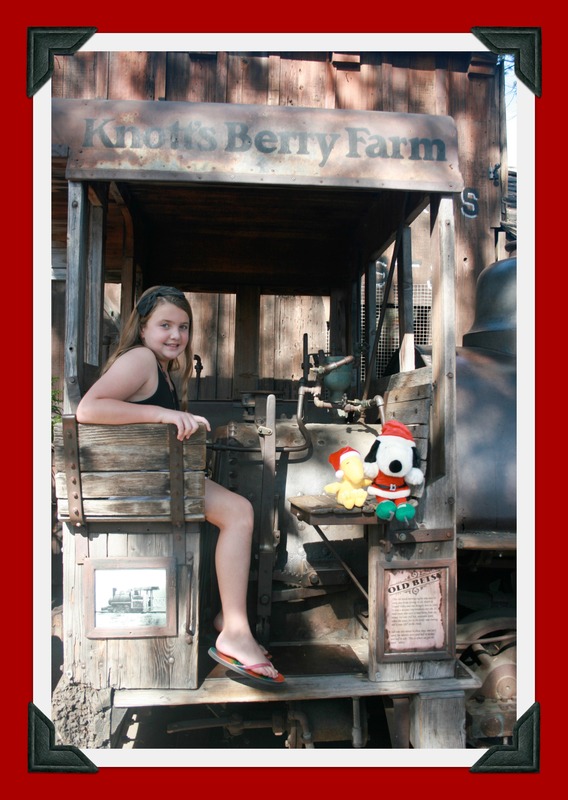 Emily loves the kid-friendly rides and all of the little areas to explore in Camp Snoopy. 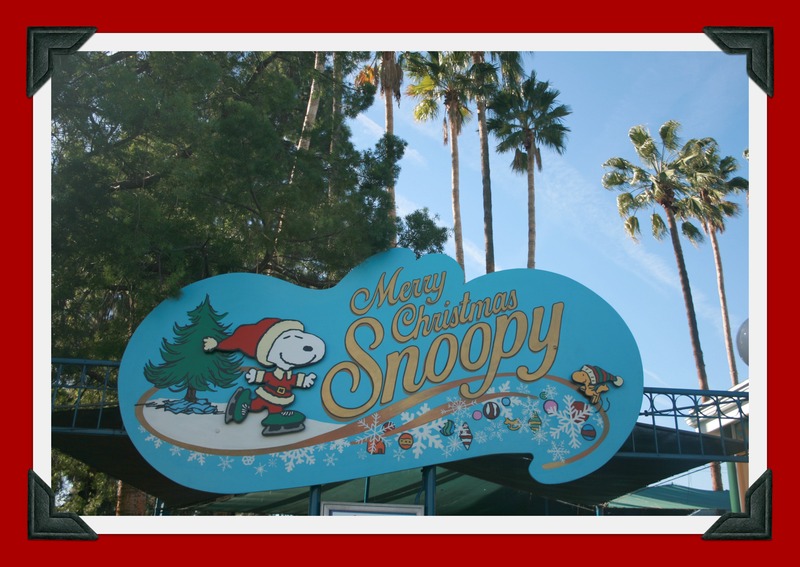 During Knott’s Merry Farm you can catch one of several performances of “Lucy’s Wish List” show, each day, over the Camp Snoopy Theatre. Some of Emi’s favorite rides in Camp Snoopy include The Balloon Race, The Grand Sierra Railroad, and the Linus Launcher . 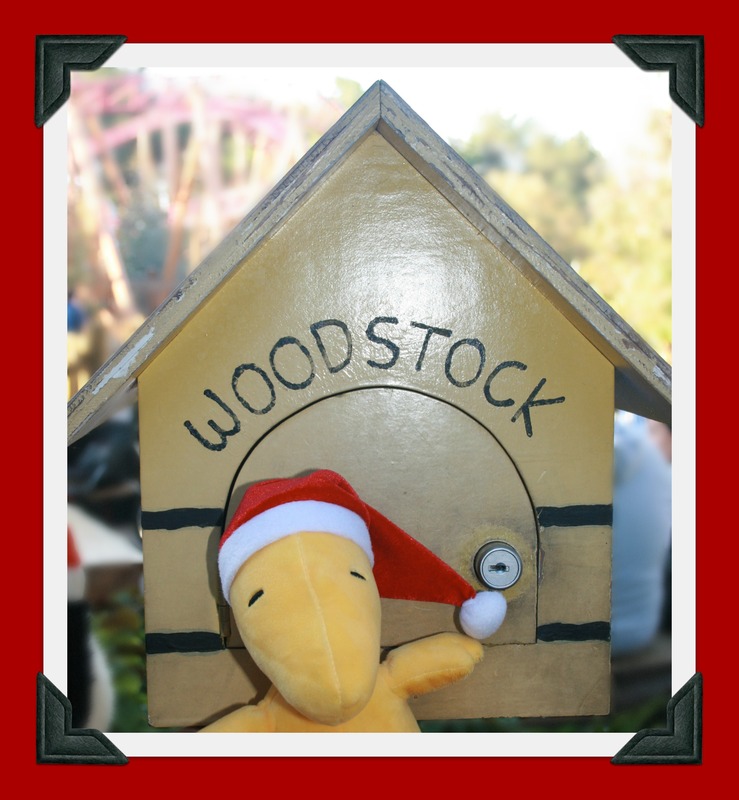 While we were there, we decided to stop by and show Woodstock his other house. 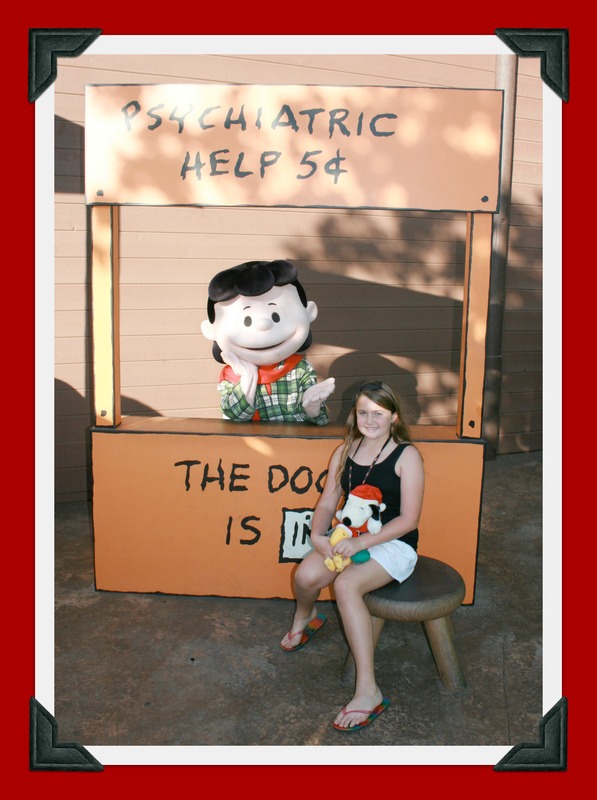 Emi also got to take a picture with Charlie Brown and sought some helpful (psychiatric) advice from Lucy. We love Camp Snoopy! It was fun to walk through Ghost Town, which has been transformed into the Christmas Crafts Village for Knott’s Merry Farm. It’s a shopping wonderland filled with dozens of local artisans selling their unique gifts. Some of the highlights of the Village include artist demonstrations of chainsaw wood carving, pottery sculpting, and elegant glass blowing. We found a lot of photo opportunities in the Christmas Crafts Village. We also enjoyed listening to carolers sing. As you continue to walk deeper into Ghost Town, you’ll find Santa’s Christmas Cabin, located inside Wilderness Dance Hall. Santa is right inside, sitting up on the stage, and waiting for you to bring your little ones to chat with him about what they’d like for Christmas this year. He also reminds them to be good for their parents, which was my favorite part! 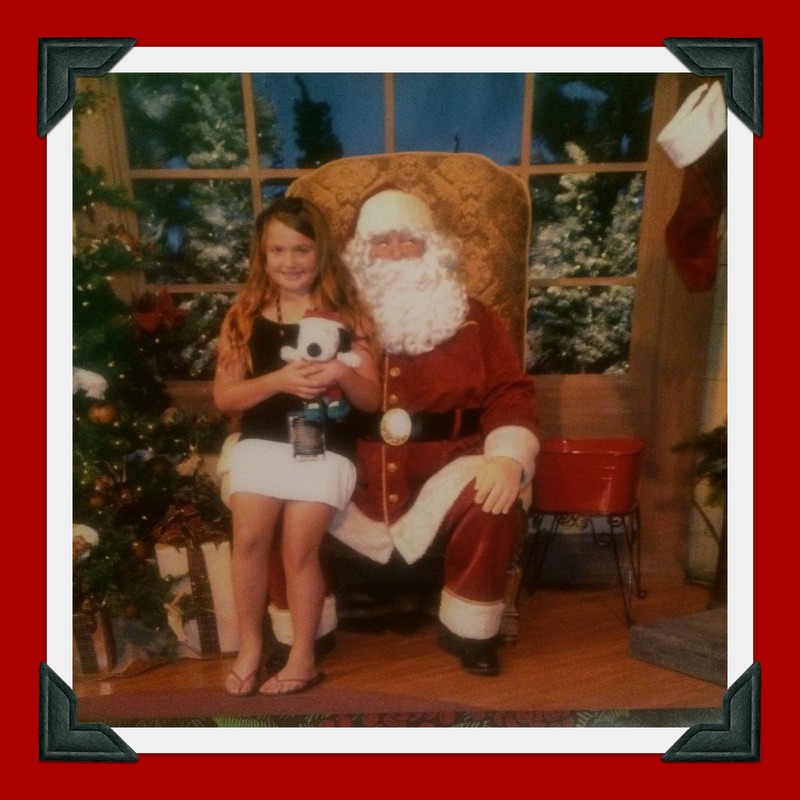 There are photographers on hand to capture the perfect moment with your little one(s) and Santa in photos available for purchase afterwards. Inside Santa’s Christmas Cabin, there are plenty of treats to choose from including homemade cookies & milk, hot chocolate, gourmet coffee and hot chocolate, s’mores on a stick, roasted nuts, winter wines and beer. It’s a nice place to sit down and take a break for a snack. 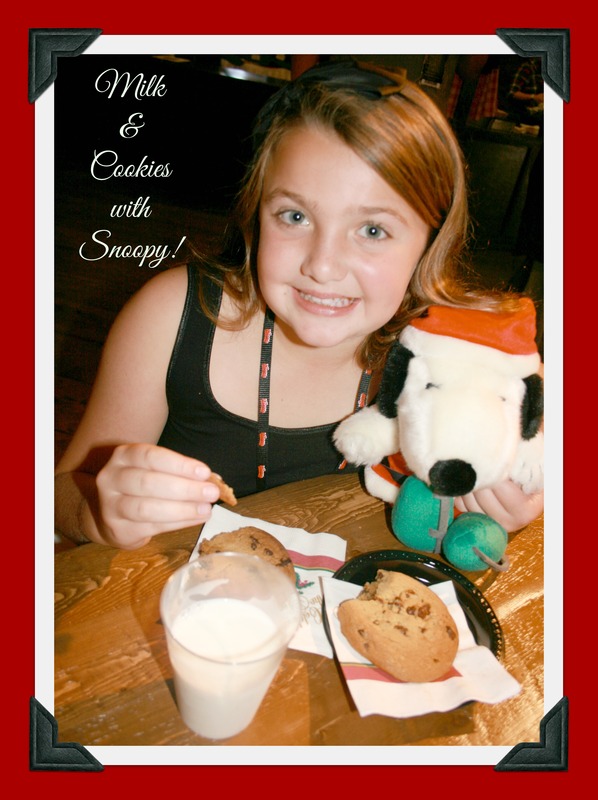 Emi loved sitting at one of the little wooden tables to share some milk and cookies with Snoopy! 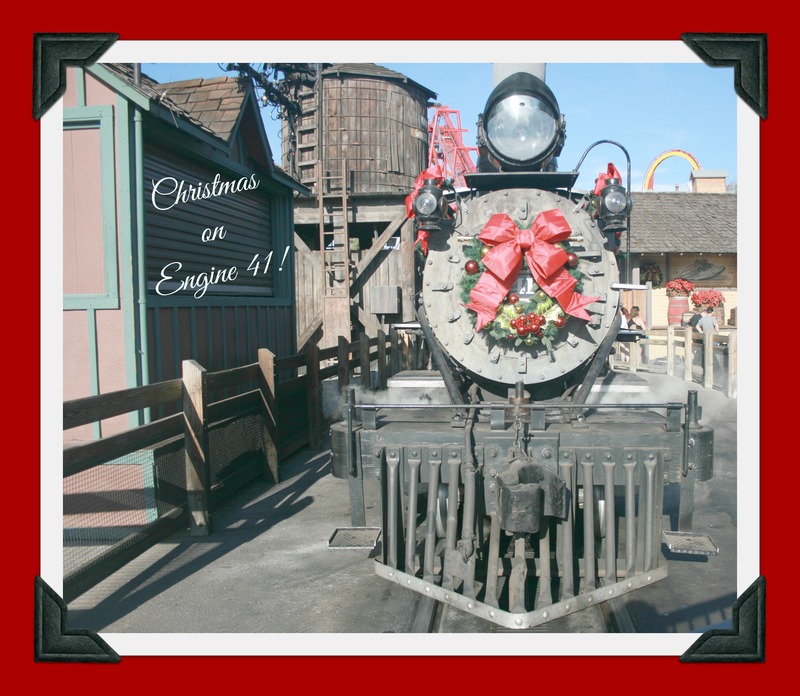 During Knott’s Merry Farm, the Calico Railroad is converted into a special Christmas on Engine 41 train ride experience. After you climb aboard the vintage railcar, you get to interact with a whole cast of characters who are ready to brighten your holidays with songs and chats about their traveling adventures. 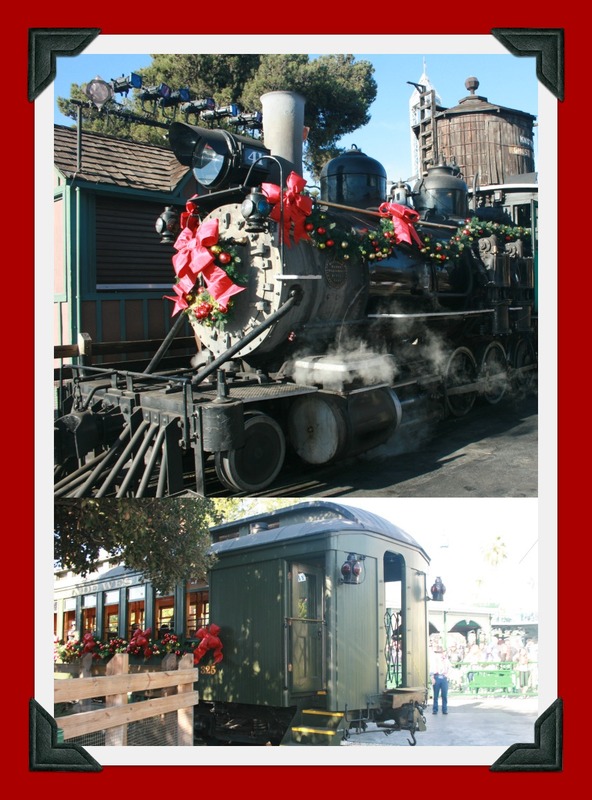 It’s a Christmas train ride filled with holiday cheer. Just past the Calico Railroad, standing in front of the Calico Square Stage, stands the Knott’s Christmas tree, adorned with hundreds of ornaments. It’s so beautiful standing tall against the sunny blue sky! Emi and Snoopy liked checking themselves out in the giant ornaments! After the sun goes down, you can enjoy watching Snoopy’s Merriest Tree Lighting on the Calico Square Stage as it lights up with the celebration of the season. It’s a musical, whimsical tree lighting featuring a cast of Toy Soldiers, Snowmen, Elves and the world’s most famous beagle, Snoopy! After dark, there’s also snowy fun each night during Knott’s Merry Farm along the buildings and paths in Ghost Town’s Main Street, as they are filled with glow and snow! Thousands of sparkling lights dance to the beat of “Let It Snow” while snow gently falls in this spectacular one-of-a-kind moment you can enjoy with your family in the Ghost Town. Emi, Snoopy, and Woodstock really wanted to eat dinner at Grizzly Creek Lodge, located inside of Camp Snoopy! They loved having a cheeseburger, fries and some Knott’s Berry Punch together. It’s one of our family’s favorites that we HAVE TO have on each visit to the park. 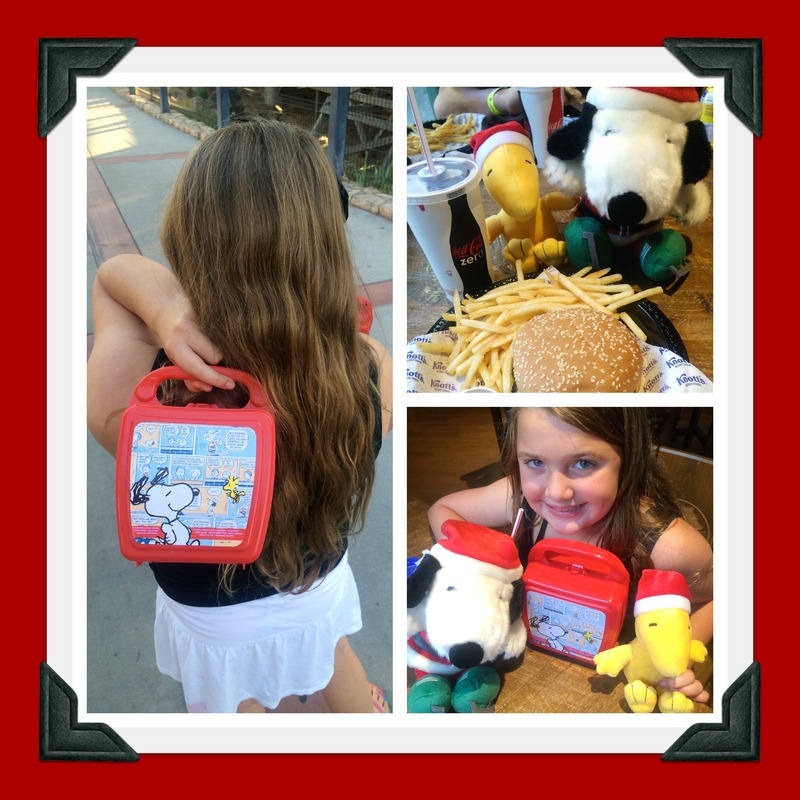 Emi loved the keepsake lunchbox that her kids meal was served in. She truly adores the Peanuts gang. 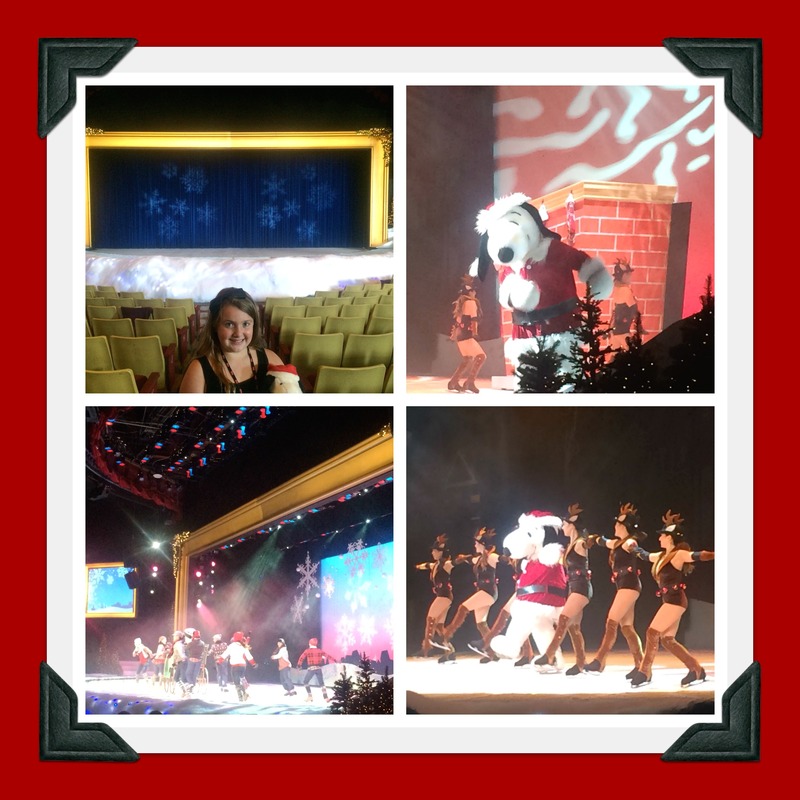 I think our most favorite show at Knott’s Merry Farm was the “Merry Christmas, Snoopy” Ice show, which is in the Charles M. Schultz Theatre. I grew up watching Peanuts on TV and now Emi loves them too. Watching her face light up as all of the characters came out to skate during the show was priceless. Skating Snoopy was precious, the costumes were beautiful, I loved the songs they chose and the story lines, and the skating was amazing! What true talent! 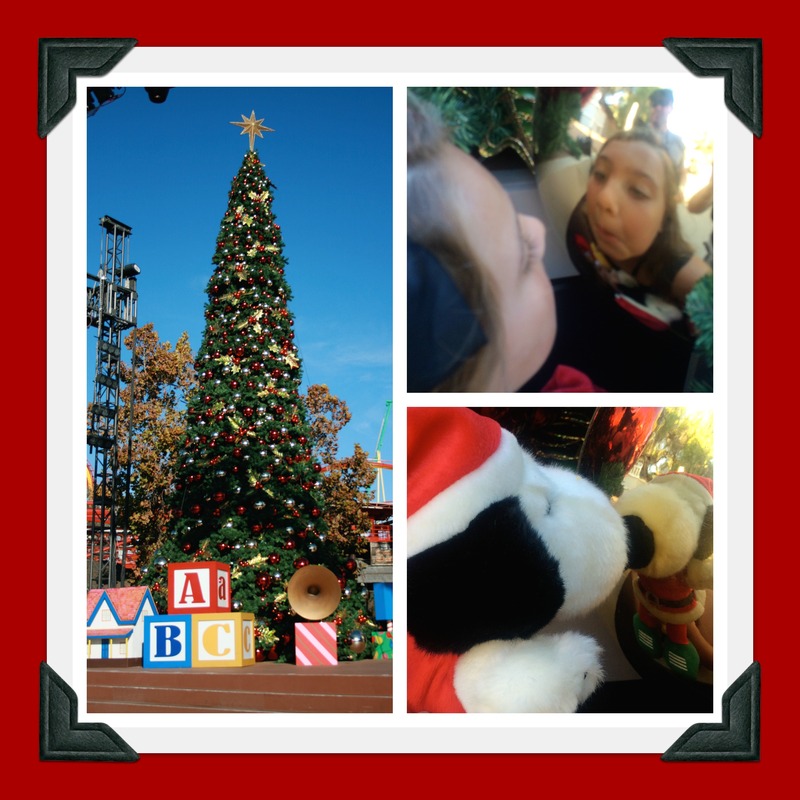 It was a great day at Knott’s Merry Farm and we’re already planning our next visit. 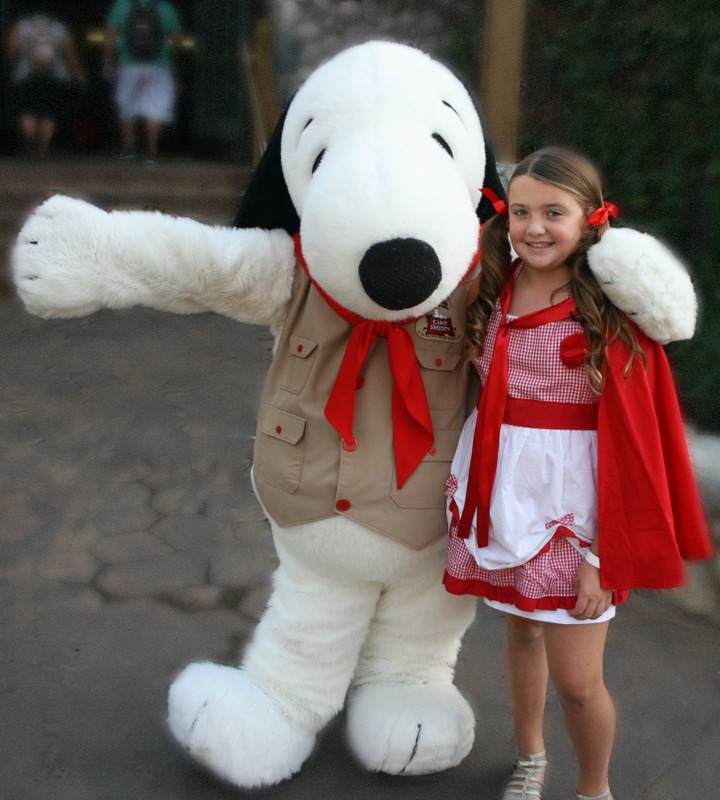 Have you checked out all of the benefits that come with a 2015 Knott’s Season Pass? They’re very affordable and make great holiday gifts! 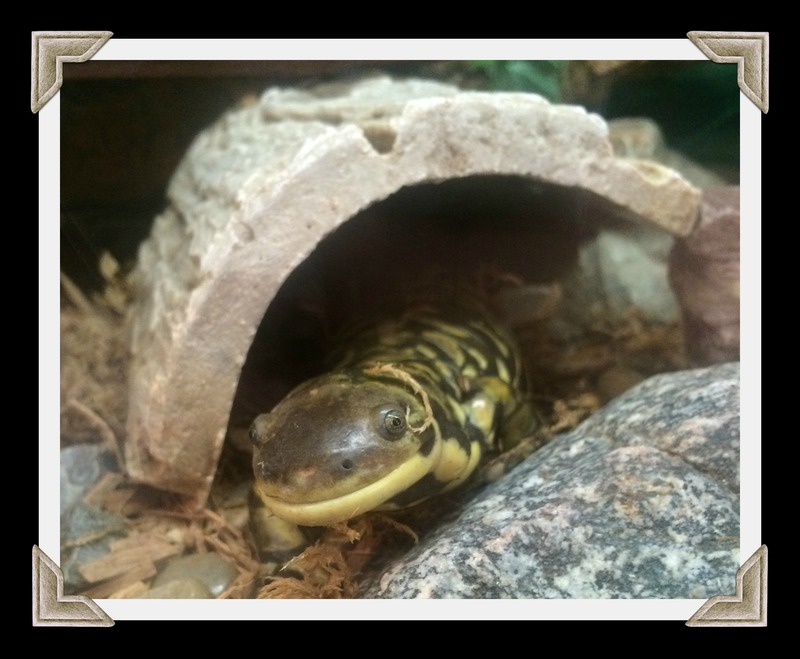 We’re considering grabbing 3 of them for our own family! 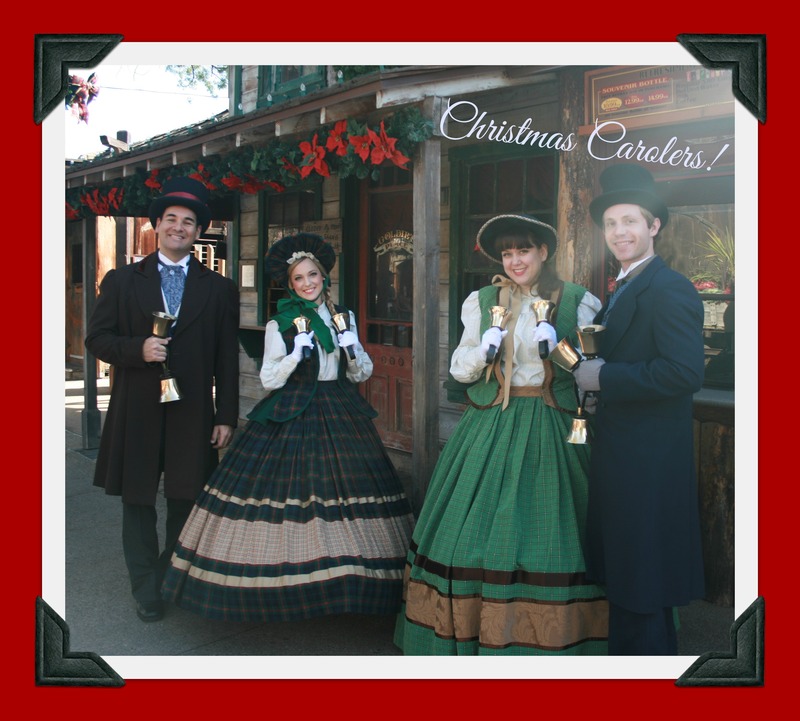 If you purchase a pass now, you get one 2014 visit to Knott’s Merry Farm for free! For more information, click here! 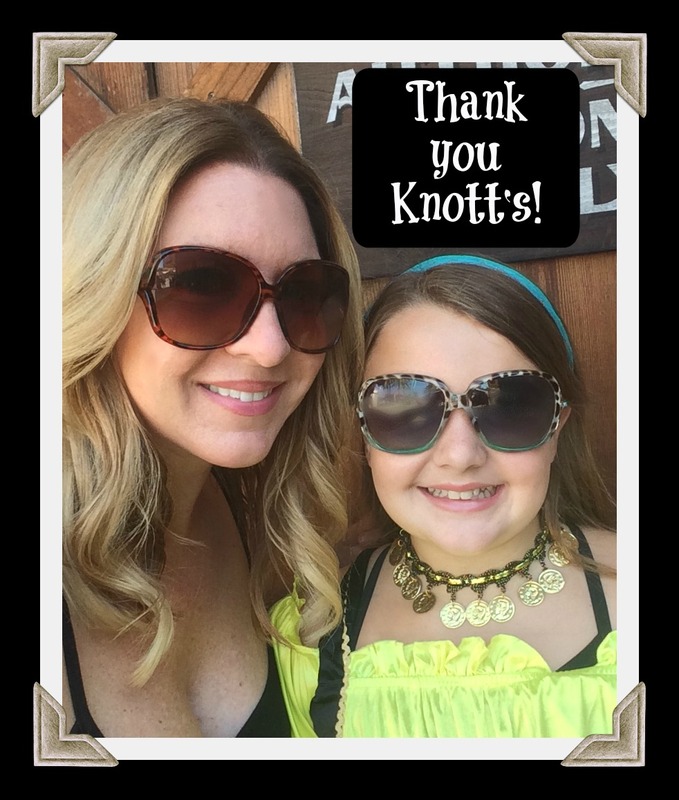 Thank you again, Knott’s! As you can tell by the smile on her face, she LOVED Merry Farm and our family is so grateful for the opportunity to have spent the day creating more memories together! Happy holidays!